It was a privilege to make these cupcakes for Allison’s mom’s 70th birthday on Saturday evening. Allison is a trained chef and makes the most gorgeous cakes so it is a really compliment from her to have her recommend my cupcakes and then to trust me to do them for her mom’s special day. We have been friends since our boys were still small and cute – around 15 years now. I like to remember the good old days when I would just pop in for tea with Allison and there was always something delectable to sample in her kitchen. Thanks Al for all the laughs then and it is always great to meet up with you for more laughs and stories. Al is now General Manager at Benvenuto and it has been great fun to display my cupcakes at their breakfast functions. The function room is always so beautifully and professionally decorated and Allison as always is such a fun and organized host to her guests. Ada wanted a variety of cupcakes for her guests and it was great as she gave me carte blanche with flavours and decorations. With this in mind I made pistachio and rosewater cupcakes which have turned out to be a hit whenever I do them. 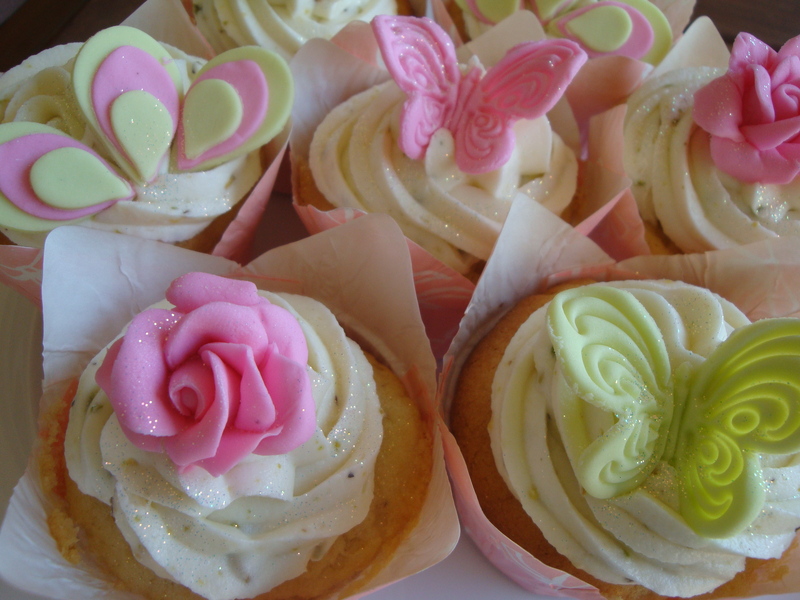 As Ada loves beautiful things I decorated these, in keeping with the flavours, with hand made sugar paste roses and lime green butterflies. I didn’t have to match colours for the cupcake display so the 2nd flavour I decide on was dark chocolate and strawberry. I made chocolate cupcakes and to the icing I added a bar of melted dark chocolate which gave the icing a rich chocolate colour and a delectable chocolate taste. 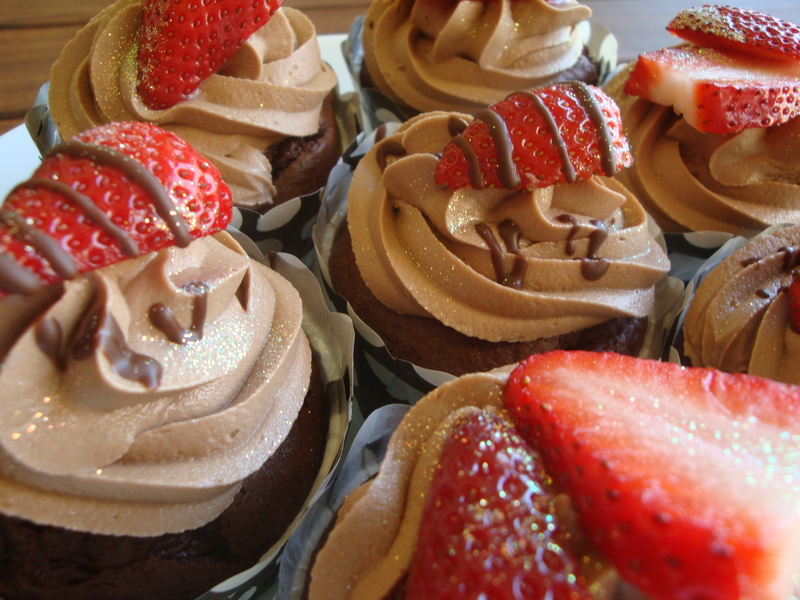 The topping for these cupcakes were strawberries just to celebrate summer finally being here. I drizzled melted dark chocolate over some of the strawberries. 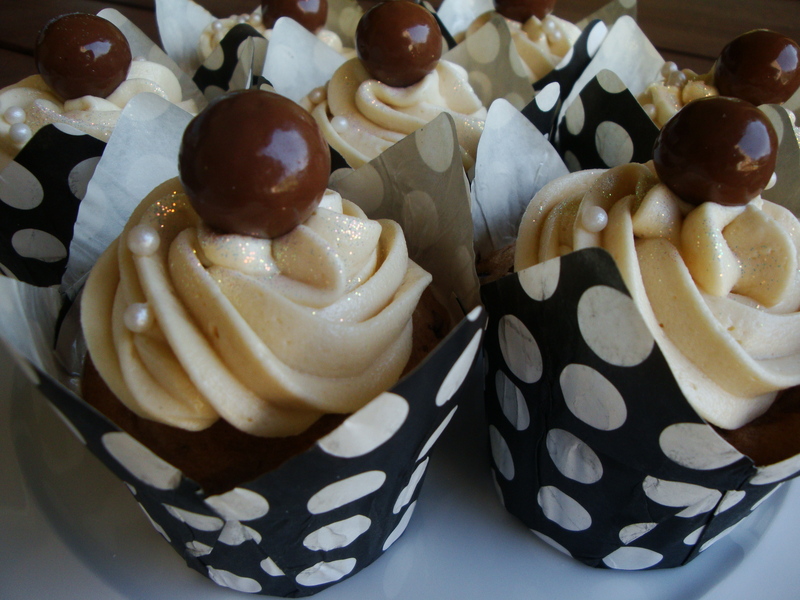 One of my favourites to make are cappucino cupcakes. I think it is because the icing with the espresso in is just so moreish. I made these for the coffee lovers and topped them with a chuckle each. The last flavour I chose was Amarula. I made vanilla cupcakes to which I added Amarula and then iced them with icing which I had also laced with Amarula. The colour of the icing changes as you add the Amarula and looks so delightfully creamy on the cupcake. 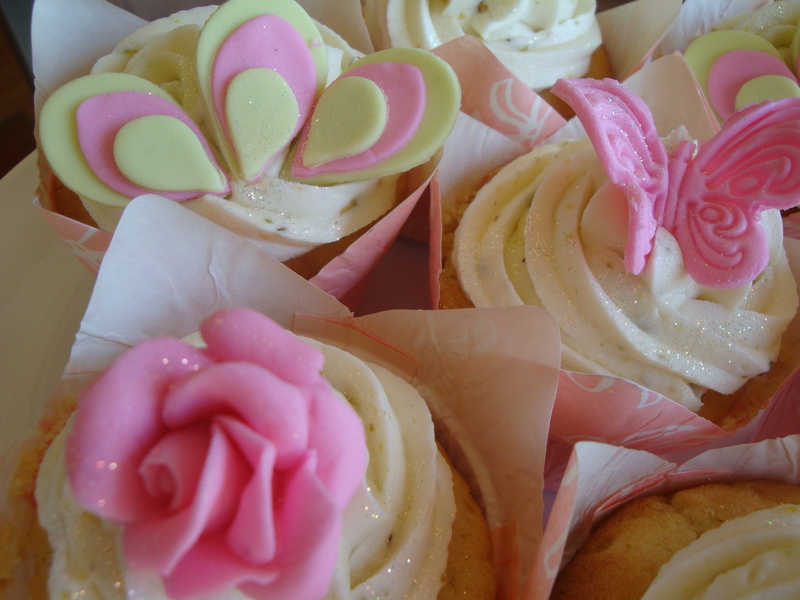 I added a small yellow flower to these cupcakes and my usual sprinkling of a bit of bling (edible glitter) to finish them off. 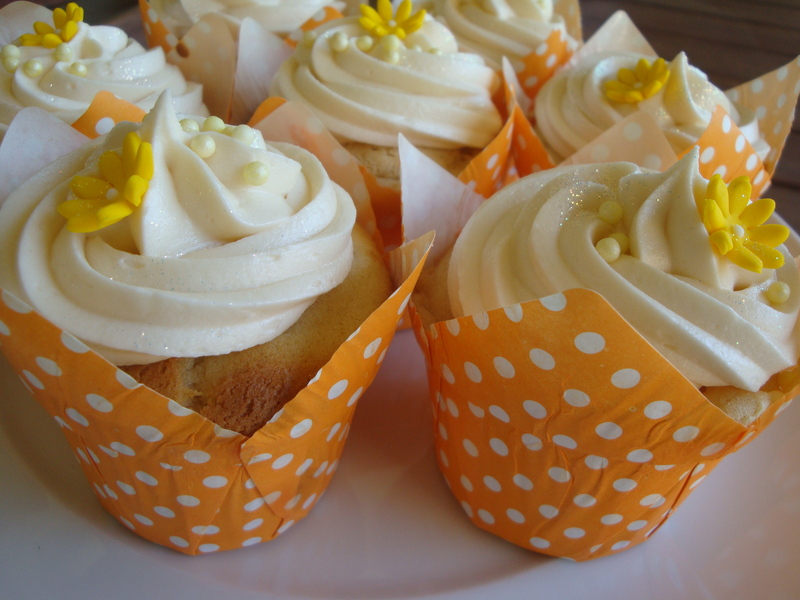 They looked really funky in these new yellow with white polka dot cupcake holders I found at Baking Bitz in Randburg. Thanks Al and Ada for allowing me to do these cupcakes for such a special occasion and I was so pleased to hear that your friends and family all loved the cupcakes. Thank you Lisa!! We did have fabulous times!!! And we will continue to have many more!!! Our guests gasps of delight said it all…. Once again – THANK YOU!!!! You have a wonderful talent!!!! Thanks Al, and once again it was a pleasure to be able to do them for you and your mom.